We will then quietly and quickly breakdown and remove the equipment at the end of gaming. What do we do with our chips at the end of gaming? You will want to provide raffle prizes for your casino night guests. You may want to solicit local businesses for prizes but, the prizes can be anything: I.e. a $50 gift certificate from a local grocery store, baseball tickets, weekend getaways at area hotels, wine and cheese baskets, floral arrangements, etc. These are things that are too small for an auction but big enough to make a nice give-away gift. Throughout the evening, your guests can turn in their chips with the Upstate Vegas Events Dealers at the gaming tables for raffle tickets to be drawn for door prizes. Upstate Vegas will provide these raffle tickets. The exchange is often one raffle ticket for every $100 to $200 in chips. Have a microphone and an “emcee” announce when drawings are going to be held. (You will want to announce this well in advance of each drawing so that there is not a rush to turn in chips for tickets). Then draw a ticket and pass out prizes. If you have a lot of door prizes, you can draw tickets throughout the evening to generate excitement throughout the evening and not create a rush at the end of the evening to pass out prizes. Have the raffle ticket for the largest prize drawn at the end of the evening to encourage people to stay for the whole event. The Upstate Vegas Events’ dealers are trained to encourage people with a lot of chips to turn them in for raffle tickets at the casino tables. What if I do not know how to play any of the games? There is no problem if you are not familiar with any of the casino games. Our professional dealers will teach you and all your guests how to play. Even for those experienced players our dealers will suggest strategy and tips to help improve their game. We also have a How to Play page on the website so you and your guests can brush up before the event! What kind of casino parties do you host? Our casino parties range in size from 10 to 1000 guests. From private home parties to corporate events and fundraisers, no event is too small or too large. We plan and execute large New Year’s Eve events, major corporate holiday parties, and 500-person casino fundraiser events. Also, we specialize in those smaller private parties for an anniversary, bachelor or bachelorette party, birthday, class or family reunion, graduation, Halloween, Monte Carlo theme event or even a wedding. We have done them all! We will provide all the professional casino equipment necessary for the complete, authentic casino experience, including gaming tables, chips, trays, cards, dice, and professional dealers for each game. What areas does Upstate Vegas Events serve? Upstate Vegas Events will accommodate your casino party event nearly anywhere within Upstate, Western New York. This includes the major cities of Buffalo, Rochester and Syracuse along with all their surrounding areas. Call or use the online form to contact us to discuss the details of your casino event. Each event is unique and booking policies may vary. To secure your event date, you must contact Upstate Vegas Events by phone or e-mail. We will confirm all the details and the date, then send you a quote/invoice contract to sign. Cancellations less than fourteen (14) days prior to the event date may be subject to a fee. Full and final payment to Upstate Vegas Events is expected the night of the casino event by cash, check, or online through our quoting system. We also accept payment through barter with International Monetary Systems (IMS). Why Choose Upstate Vegas Events? years of experience, since 2001.
a high level of professionalism. table games that are the real thing. a desire to teach all that want to learn to play. the ability to entertain all your guests. our insurance policies in place. an ability to take the stress out of your event. our dealer’s professionalism and friendly attitudes. the desire to offer a fair price with no hidden fees nor added gratuity as some do. Our company has more than 500 clients, with more than 2000 casino events held. It has consistent performance and superior service. Our services are reasonably priced and we are fully insured. Don’t you want to deal with the best? Why is Upstate Vegas Events the best choice to host your Fund Raiser, Corporate Event, or Home Party? 12. We are a registered company in New York State and carry a $2,000,000 liability insurance policy which can add you as additionally insured. – Upstate Vegas Events is a responsible company you can trust. 11. Upstate Vegas Events hosts nearly 200 events a year: 1 table to 80 tables is no problem for us. Whatever your budget, we would love to host your event. – No one in Western New York does more casino events than Upstate Vegas Events. 10. We bring only the highest quality custom-built casino tables to your special event, quality your guests will recognize and that will bring the real feel of Las Vegas to your event. 9. Upstate Vegas Events dealers are energetic and very personable. They are always well dressed in our Upstate Vegas Events uniforms, not to mention professionally trained. We don’t just send “somebody” to your special event… we send experienced and friendly dealers! 8. We invite you to check out our Upstate Vegas Event’s website for pictures of our equipment and videos of the gaming experience before you rent. Know what you will get so there are no unwanted “experiences” or “productions”. 7. Upstate Vegas Events is the one of the few casino rental companies associated with the National Association of Casino Parties Operators (NACPO) to help you raise thousands of dollars in one night for that special client or cause. Our company has raised more than $1M at our fundraising events, and we are the fundraising pros! We will meet with you to discuss the best way to make the most of your fundraiser. Upstate Vegas Events has the experience to make your party a success. 6. The largest party planners in Western New York use Upstate Vegas Events to host their client’s casino themed parties. Your reputation is on the line? We won’t let you down! 5. Upstate Vegas Events won’t subcontract out your casino event to a 3rd party. When you make your reservation with Upstate Vegas Events to host your event… Upstate Vegas Events will host your event. 4. We will provide a clearly written contract without any hidden or surprise gratuity costs. Upstate Vegas Events doesn’t ever leave anything to chance. We have a clear contract to make sure there are never any surprises. 3. 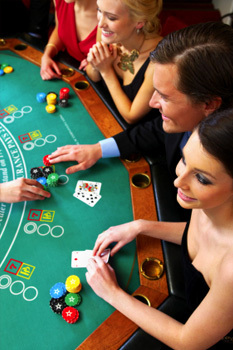 Upstate Vegas Events has the largest selection of casino rental equipment in Western New York! We constantly update to the latest games and the best equipment to meet our customer’s needs. Looking for something special? Just ask! 2. We will never “trade up” your casino party. Unscrupulous casino rental companies will forfeit your reservation if a larger (more profitable) event comes along. We love our customers too much to do that. 1. Upstate Vegas Events has an A+ rating with the Better Business Bureau. Making sure you have the best fundraiser, corporate event, or private party is our number one goal! Not at all. We welcome guests of all ages to participate in our casino parties, because no cash is being exchanged. Yes, Upstate Vegas Events provides casino parties for entertainment purposes in which no cash is being exchanged. Guests can learn to play and have lots of fun without the financial risk. We will be happy to answer any questions you may have about Upstate Vegas Events or our casino parties and casino events. Feel free to contact us.